As the first update of 2018, we're introducing major features like Google Pay and Square Register to online stores powered by 3dcart. but there is much more in this release to help retailers increase conversions and sales. Serve more customers and offer unparalleled shopping convenience with new payment methods! We've integrated Google Pay, which allows customers to use their Google Wallet to complete transactions on your store on both Android and desktop. 3dcart also now supports 3-D Secure 2.0 through our integration with Cardinal Commerce, which includes Verified by Visa, Mastercard SecureCode, American Express SafeKey and Discover ProtectBuy. You can now give customers without PayPal accounts the option to check out through the Guest Checkout option of PayPal Express. We've also integrated Affirm, which is a loan payment solution that allows your customer to sign up for an Affirm loan for orders over $50, which they can then pay in installments while you are paid in full immediately. We've also added Heartland Payments as another integrated payment gateway. Our brand new Pre-Orders Module provides a streamlined way to handle pre-orders on your 3dcart store, and works by pre-authorizing the customer's card for the purchase amount, and then automatically moving the order to New status when the item becomes available, at which point funds are captured. Pre-Orders are available on Pro or higher 3dcart plans and require a payment gateway with tokenization. We're also proud to announce a new integration with Square POS, complete with inventory synchronization and import/export capability so you can seamlessly use Square POS to sell products face-to-face and simultaneously on your 3dcart store. We've integrated with Drip, an automated marketing solution for handling personalized emails, super-targeted Facebook ads, and more. The 3dcart integration provides complete synchronization between Drip and your 3dcart store, including all subscribers and their purchases, so you can create extremely effective, precision marketing campaigns. We've also improved our USPS integration to allow merchants to use the "Signature Required" option when printing USPS labels from their 3dcart dashboard, and updated our connection to Australia Post to ensure display of their latest shipping rates. Version 8.1 introduces several updates and improvements to the 3dcart Online Store Manager, all with the goal of making it easier and more secure for you to run your online store. We've brought the option to set up 2-Factor Authentication to log in to the admin panel, which provides an extra level of security in the case that your password is compromised. We've also completely redesigned our Phone Orders system to make the process of taking a phone order much smoother, with dynamic searches for customers and products. We've added a category filter to Automation Rules, which enables product categories as filters when defining whether an order will trigger an Automation Rule. Data exports have been optimized for speed and performance, including exports of orders, products, and customers. We've also extended Canonical URLs to cover Extra Pages. With 3dcart Version 8.1, running your online store will be smoother and easier than ever. With the release of 8.1, we're making our new Core Themes available in the 3dcart Theme Store for the first time. Core Themes are built with the new standards of the Core Templating Engine for increased speed and functionality, improved mobile-friendliness, and easier customization for designers. We've launched about 25 Core Themes, the majority of which are free. 3dcart store owners will have immediate access to the free Core Themes as soon as the 8.1 upgrade applies. 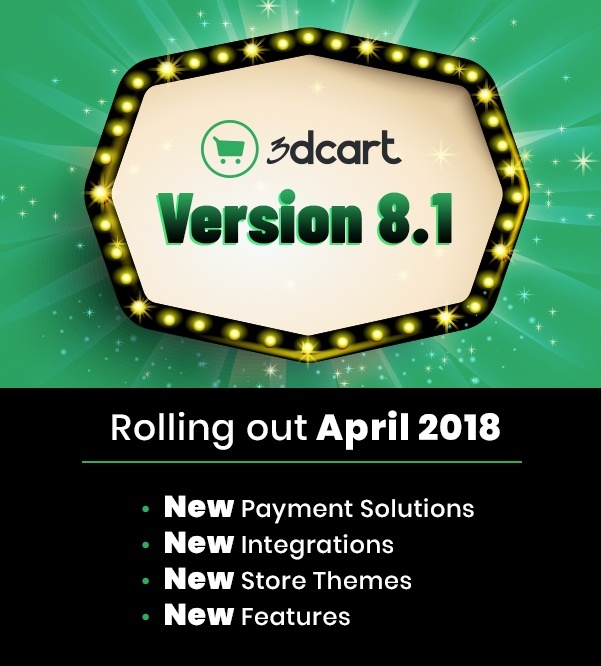 We will be slowly rolling out 3dcart Version 8.1 during the month of April, and it will be about 3 weeks before all 22,000 3dcart merchants receive the update. The process takes place in the background and you do not need to do anything. But if you do have questions, please feel free to contact us.